The concert was a musical revue of the history, culture, and achievements of Israel and which featured Hadar Orshalimy on vocals and keyboard accompanied by Sheldon Low and Gregg Monteith. Prior to the concert, a Middle Eastern dinner was catered by Annabel Cohen, caterer and food columnist for the Detroit Jewish News which included wines from Israel. Hadar Orshalimy is one of the most highly sought after cantorial soloists and children’s music educator in New York, regularly leading Shabbat and holiday services at Temple Israel of the City of New York, Temple Emanu-El of New York City, and at communities all across the New York Metro area. Hailing from Tel Aviv, Hadar’s early singing career included numerous appearances on national Israeli broadcasts including being featured on the Children’s Channel, commercials and radio, televised basketball games, and the first season of Israeli Idol. In 2004, Hadar moved to the US to attend the Berklee College of Music where she graduated with honors. After Berklee, Hadar has become involved in Jewish music, performing with Jewish rockers Josh Nelson and her life-partner, Sheldon Low, and has co-written and performed on 5 of Low’s albums. 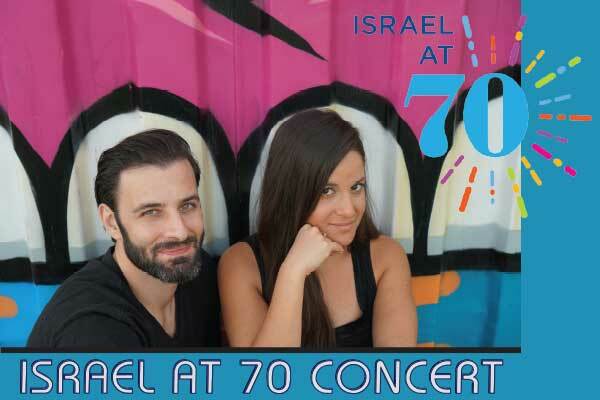 Hadar served as the music specialist and musician in residence at both Larchmont Temple and Park Avenue Synagogue and most recently, Hadar and Low have created a new secular music band called “We Are The Northern Lights”. The band is beginning to achieve national acclaim, thanks to their singles “I’m Still Here” and “Sunshine”, both being featured on the TV series, Startup, starring Adam Brody and Martin Freeman. In January Hadar performed at Temple Emanu-El Manhattan at a reception for Barack Obama. Sheldon Low continues to establish himself as a prominent voice in contemporary Jewish music. He has released 5 full-length albums and received placements on three Ruach compilations to date. A self-proclaimed road warrior, Low performs over 100 concerts, services, and workshops around North America each year. In addition to becoming a mainstay of congregational life, Low’s music has become the soundtrack of the lives of hundreds of thousands of children around the globe, thanks in part to PJ Library distributing two of his children’s albums and appearances on countless other compilation albums. Beyond his acclaim as a Jewish musician, Low is a highly regarded Jewish educator and published author. Low is currently the artist-in-residence at Temple Israel of the City of New York and lives in Harlem with his wife and musical partner, Hadar Orshalimy. Together they are known as the pop-folk duo “We Are The Northern Lights. Look for Sheldon’s podcast jewishsongwriter.com. Gregg Monteith has performed throughout the world as a drummer/percussionist for numerous Broadway productions. Most recently, he performed at Madison Square Garden with the hit musical Elf. Gregg is also a filmmaker working with brands like Sharpie, Lowe’s and Breathe For Change. Love to Karen.